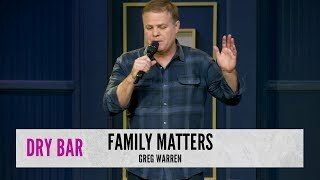 Greg Warren, most recently seen on "The Late Late Show" and "Comedy Central Presents" has built a strong fan base with an act inspired by his Midwestern upbringing. His CDs, "Running Out of Time" (Sept 2013) and "One Star Wonder" (June 2009) hit #3 and #6 respectively in iTunes Top Comedy Albums. An honest mix of self-deprecation, frustration and an arsenal of lifelike characters highlight Greg's colorful perspective. Greg attracts a diverse audience spectrum, having performed as a "Coming to the Stage" finalist on BET and on Country Music Television's "Comedy Stage." He is also a favorite on the nationally syndicated Bob & Tom radio show, which led to touring theaters across the country with The Bob & Tom All Stars Comedy Tour. Greg hails from St. Louis, MO, where his father was a high school wrestling coach and his mother made him play clarinet in the band. He has captivated audiences with anecdotes about the conflict inherent in meshing the two disparate high school identities of varsity wrestler and band geek. Greg's "Flute Man" bit is a perfect encapsulation of the insecurities of high school and the ongoing quest to be cool, and is one of the most requested bits in the history of the Bob & Tom Show. Greg was also a West Point Cadet, where he distinguished himself by amassing an impressive tally of demerits and endless hours of pointless marching. After moving on to the University of Missouri, he studied journalism and became an All-American college wrestler. During college, Greg won a comedy contest and was invited to perform at Déj‡ Vu, a local club in Columbia, MO. After a stint selling Jif and Pringles for corporate giant Procter & Gamble, Greg made the decision to become a full-time comedian. This bold move led to an invitation to Montreal's prestigious Just for Laughs Comedy Festival in 2002, where Greg performed as one of the featured New Faces of Comedy. He has also been seen on the Comedy Central series "Premium Blend" and "Bob and Tom Radio Show: The Comedy Tour." Greg's background resulted in a gig doing college wrestling color commentary for Fox Sports Midwest. He is heard daily on Sirius/XM Comedy and headlines at Improv and Funny Bone comedy clubs across the country. He appeared in the independent film "23 Minutes to Sunrise" (2011) and will be featured in the upcoming film, "Marshall The Miracle Dog" with Matthew Settle, Lauren Holly and Shannon Elizabeth. He is a founding member of the St. Louis Sketch Week Players whose sketches can be heard on Sirius/XM, Pandora and 24/7 Comedy Radio.